February 11, 2014 (ATN) - The regime of Western-backed, accused mass murderer, convicted criminal and fugitive Thaksin Shinawatra (background here) has overseen a disastrous, ill-conceived vote-buying rice subsidy program that has since collapsed amid a whirlwind of corruption, scandal, outright theft, and incompetence. Thousands of farmers across the country remain unpaid now for over half a year with their rice left rotting, unsalable in government warehouses. The regime has failed to raise the capital necessary to pay the farmers both because it has failed to find buyers who have since turned to other nations due to concerns over price and quality, and because investors are disinterested in buying bonds offered by the regime to cover massive and continuously mounting losses. Image: Regime Finance Minister Kittirat na Ranong - a self-admitted liar - claims there are "many commercial banks" willing to loan money to him in order to pay cheated rice farmers - but has failed to name any of them or provide any details as to when payments will be made. Rice farmers have gone unpaid for rice they have already given the regime for over half a year now. While the West, who has propped up the Shinawatra regime for over a decade in return for economic and geopolitical concessions, continues to portray ongoing protests against the regime as "Bangkok elitists," throngs of rice farmers have been making their way to Bangkok to join the growing dissent. In response, instead of accepting responsibility for its reckless incompetence, the regime has elected to peddle false hope to the impoverished and desperate rice farmers - some of whom have begun committing suicide in despair over mounting debt. Thaksin Shinawatra's nepotist proxy, sister Yingluck Shinawatra posing as Prime Minister, claimed the regime is "is not broke and will certainly pay the farmers for their pledged rice," according to the Bangkok Post's report, "PM: Govt not broke, will pay farmers." 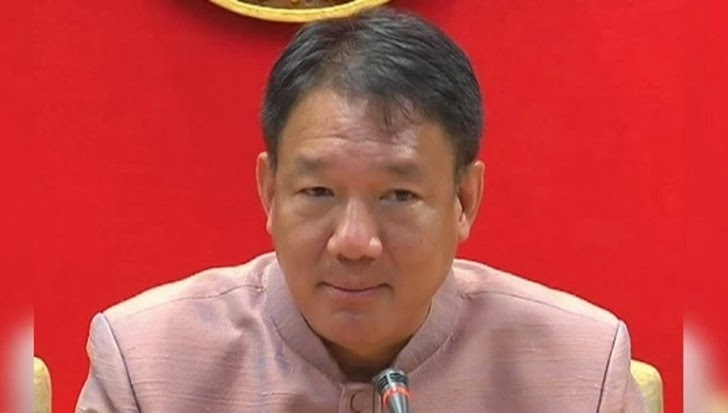 Caretaker Finance Minister Kittirat na Ranong said today that many commercial banks have now shown interest to provide rice loans to the caretaker government to pay farmers. He said that these banks have gained understandings of the scheme and have expressed interest to extend loans to the caretaker government. He said the caretaker government was ready to sign the loan agreements immediately once they propose appropriate lending rates. But he said he could not reveal their names on fear that anti-government protesters could again go to blockade these banks if they have the information. He said that after the loan signing, farmers who have rice vouchers could go to these banks to get full amount of payments stated in their vouchers. Kittirat also asked farmers to understand the government’s obstacles in securing loans, while stressing its intention to help farmers. The finance minister may lie to the public if necessary to establish confidence, says Kittiratt Na-Ranong, the finance minister and deputy prime minister. "The finance minister can lie about some things, such as export targets. But these are white lies," he said yesterday. "If I said from the start that we couldn't grow, what would be the impact on confidence? One might imagine Kittirat equally willing to lie to save the crumbling regime he is a minister within. Unable to cite a single shred of evidence of his promised "loans," his deceitful track record should lay to rest the veracity of his most recent statements. To sell false hope to impoverished, desperate farmers is perhaps among the most depraved acts committed by the current regime - terrorism and assassinations aside. Rice farmers, upon the backs of whom the regime climbed into power, are now seeing the true nature of the "populism" the regime's Western backers have praised. It was a ruse that, along with the facade of "democracy," the regime used to establish its corrupt, authoritarian dictatorship - a process the Western media played an accomplice to for years. Now that rice farmers are joining the ranks of enduring protests that have occupied Bangkok's streets for months, the West and the regime itself is finding it more difficult to camouflage itself with "democracy," majority support, "class war," and other tired distractions. Solutions for the rice farmers implemented by the protesters themselves will only further expose the regime and its foreigner backers, their true agenda, and the urgent necessity of removing them permanently from Thailand's political landscape.